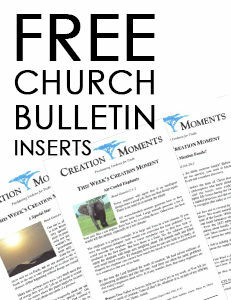 STAND STRONG FOR BIBLICAL CREATION WITH FREE CHURCH BULLETIN INSERTS! 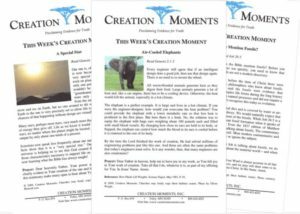 To help everyone in your church stand strong against atheistic evolution, Creation Moments has available free creation science inserts for your church bulletin. Each month we bring you new inserts you can freely print, copy and distribute. 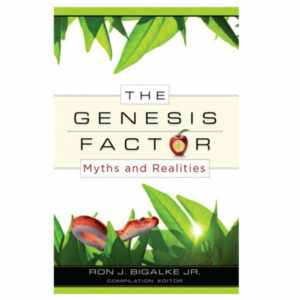 Also available are Biblical Creation Youth Bulletins intended for readers of High School age and up. Our goal is to equip Christians with the truth of biblical creation and give them a tool they can use to share the truth with unbelievers. Click on the link to view and download the bulletin inserts. Print the insert in color or black-and-white. Copy them, cut them in half and insert them into your church bulletin each Sunday. And place a stack at your information counter. Everybody Want to Be A . . .
Could Poison Frogs Poison Themselves? Hurricanes: Are They Our Fault? Did Dinosaurs Stop to Smell the Roses? New Antibiotic Discovered Inside Your Nose! What’s the Smallest Thing You Can See? Which Came First – the Orchid or the Moth? Why Did God Give Us Fingernails? Theory, Hypothesis … Or Something Else? Has Evolution Produced Anything of Practical Value? Are Biblical Creationists a Stumbling Block? Virtual Reality – Blessing or Curse? What’s This? A Warm-Blooded Fish? Carbon-14 Being Found in Dinosaur Fossils! Don’t Mess with the Hoopoe! Why Did God Give Us Fingerprints? First Hero in the Bible’s Hall of Faith? Universe Not Expanding After All? New Type of Eye Discovered! Does the Lion’s Tooth Bite Your Lawn? Is Easter Central in Your Life? What Did History Do with the Dinosaurs? Could Creation and Evolution Be Telling the Same Story? Simple to Complex or Complex to Simple? Could You Spend Winter Outside? Could Leviathan Be a Dinosaur? Who Said the Earth Was Flat?! Spiders the Size of a House? Is It Orchid or Insect? Does Evolution Allow the Supernatural? Could Adam Have Lived That Long? Did Job Have a Weather Satellite? Is the Shark Related to the Pig? Do You Have “Extra” Parts? Does Biology Rule Out Christmas? For the Sheer Joy of Variety! How Do Plants Know It’s Fall? Is the Shark a Living Fossil? This Shrimp Packs a Punch! Did Ants Invent the Electric Knife? Do You Know How Complex a Single Cell Is? The Kangaroo Had to Have Hopped into Existence! Was There Enough Room on the Ark? Were You Once a Fish? Does the Bible Mention Fossils? Have Evolutionists Found a Bad Design in the Eye?